Rory McIlroy walks off the course after finishing his disappointing Masters round on Sunday. It wasn’t so much the sympathy that went out the window for Rory McIlroy early on Monday morning, but the worry. Strolling through Dublin Airport with nothing more to occupy my small mind than concern for Rory’s Augusta collapse the night before, I saw an old friend in the distant. It’s not unusual by the way. Betty, originally from Finglas and now living in Navan, works in duty free at the airport and tends to be there a lot, funnily enough. Indeed, it’s almost a holiday ritual in our family to say hello to Betty before we jet off on a sunshine break. At least it was before the Celtic Tiger imploded and the bank balance suffered a back nine collapse all of its own. That explains why I wasn’t all that surprised to see Betty as I walked through the long hall adorned with shops that awaits you once you’ve cleared security at Terminal One. What did surprise me was the look of despair on Betty’s face. The happy go lucky smile that is her norm was nowhere to be seen so I did what I always do in such situations – I begged her to cheer up. Alas, and you can probably guess what’s coming next, I wasn’t to know why Betty looked forlorn and downright sad. Her 89-year-old dad had died the previous week and she wasn’t the better of it on her first day back at work. Everywhere she went, people offered their condolences -- until she met me. 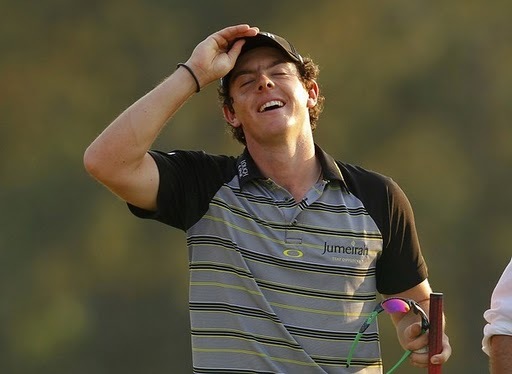 It’s not the first time I’ve put my foot in it and it won’t be the last, but it did offer a salutary lesson just hours after the world caved in on Rory McIlroy as the same world watched that drive at the 10th in the final round of the 2011 Masters. As I left Betty behind, having offered my own sympathy and urged her to go home and start her working life again another day, I was reminded of a great quote from John O’Sullivan, father of athlete supreme Sonia. On the night his daughter ran out of the medals at the Atlanta Olympics, John reminded us that sport is only sport. “Nobody died out there,” he told RTE’s Tony O’Donoghue as the nation waited to pick at the bones of a sporting disaster. It’s a quote that has stuck with me, and one that still makes so much sense. Nobody died in Augusta on Sunday night either, not on the golf course anyway. So McIlroy didn’t win the Masters and he didn’t get a green jacket, and he didn’t experience the life changing emotion of winning a Major. So what? He still has his youth. He still has his health. He still has his family waiting back home in the real Holywood to throw their arms around him and offer comfort and solace when the front door is closed on the world. Yes, McIlroy will be hurting right now. He will be kicking himself that he hit that wayward drive into a part of Augusta National normally populated by residents and their staff when he stood on the 10th tee on Sunday afternoon. But someone will remind Rory McIlroy this week -- if they haven’t done already -- that golf is only a game. He won’t starve and he won’t bleed and he won’t die because of anything that happened in Georgia last weekend. Real life carries on away from the golf course. In real life, people hurt, people bleed, people lose their loved ones just as my friend Betty did last week. What’s important for McIlroy right now is the love and support of his family and some perspective. He’s already said he will bounce back from this upset. He has already said that he will learn from it. We should believe him. At 21, he can only be better for the experience, harsh and all as that sounds. Life will carry on for Rory and for Betty. I have no doubts whatsoever that it will still be a great life for McIlroy, and I can only pray for the same for my friend and for all of us. Golf is only a sideline, a wonderful sideline, but a distraction nonetheless. The real drama goes on outside the Augusta ropes, and it will continue to do so long after we’ve all moved on from the 2011 Masters and Rory’s rapid demise on Sunday. It’s over and it’s done with. So Rory, carry on my wayward son. There’ll be peace when you are done. Lay your weary head to rest. Don’t you cry no more. There’s a song in there somewhere! GOLF: Nice touch from Graeme McDowell on Saturday. Not long after his own Augusta disappointment -- he easily missed the cut -- McDowell was out on the course following Rory McIlroy through the third round with the ordinary common fans -- or patrons as they like to call them down Magnolia Lane. McDowell was so impressed with McIlroy’s performance that he sent the youngster an interesting text. “He said he loved me but I’m not sure if that was his heart or the beer talking,” joked McIlroy on Saturday night. Great line too from Padraig Harrington, who admitted, after his own Friday exit, that he had “putted like a Muppet.” Miss Piggy may sue. RUGBY: Good news for Ireland fans ahead of the World Cup this autumn. Leinster are safely into the Heineken Cup semifinal and Munster are through to the last four of the Amlin Challenge Cup after superb wins over Leicester and Brive respectively on Saturday. With both teams playing their semis at home at the end of their month, there is real hope that they will make the two European finals. Coming on the back of that win over England, this run of form can only augur well for national coach Declan Kidney ahead of the autumn trip to New Zealand even if Ulster lost their quarterfinal to Northampton on Sunday. RACING: Say a prayer for young Meath jockey Peter Toole, currently battling for his life after a fall at Aintree in one of the early races on Saturday’s Grand National card. The “do gooders,” as a leading trainer called them on Sunday, are aghast at Toole’s life threatening injuries and the death of two horses in the National and the most famous horse race in the world is the subject of major debate again. The protestors may have a point, but there are far more dangerous things in life than horse racing and many of them are legal. GAA: Mickey Harte has suffered more than his fair share of sorrow at this stage, but his presence at the funeral of murdered Catholic policeman Ronan Kerr in Omagh is to be commended. That he carried the coffin and handed it over to members of the Police Service of Northern Ireland sent out a real message to the dissidents responsible for Kerr’s death, and those who want to drag Ireland back into the dark ages. Well done Mickey. SOCCER: Neil Lennon promised Celtic fans that he won’t be going anywhere soon in a News of the World interview on Sunday. The former Northern Ireland international says he won’t driven out of Glasgow by the bigots who have subjected his family and himself to bigoted sectarian attacks all season. Proper order too. GAA: North east rivals Meath, Louth and Monaghan will all play in Division Two of the National Football League next season after dramatic action on Sunday. I’d just love to be in the Louth dressingroom before their date with Meath and the repeat of last year’s controversial Leinster final. GAA: There was a joke years ago about the president of Ireland, Gerry Adams and the Queen of England presenting the Sam Maguire trophy to the Leitrim footballers. With the Queen and President Obama on their way to Croker next month that joke may yet become a reality! ONE Sunday paper described the Grand National winning jockey Jason Maguire as a Corkman. He’s not. He’s from up the road from me in Kilmessan and the whole of Meath is proud of him. Many of us are also glad that we backed him aboard Ballabriggs on Saturday in a display of Royal loyalty -- at a very nice 14-1, thank you. THE BBC coverage of the Masters was better than Sky’s, but that’s only because they don’t have the irritating Butch Harmon looking at you crooked every second minute. What the BBC did have was a man who referred to Rory McIlroy as British when he was winning the tournament, and Irish when he threw it away. Buffoons.